my pins have been copied. The reporting process for Alibaba, AliExpress, TaoBao, and 1688 is a little more complicated. However, once you have created an account in their IP protection platform, it is quick & easy to report counterfeits. Report, report, report! And then do these things. Your customers and social media followers are your biggest advocates, so tell them how art theft affects you! Encourage them to keep an eye out and spread the word. Consider adding a counterfeit reporting form to your website. You can even offer a % discount for reporting counterfeits. Vet stockists before wholesaling or consigning with them, and refuse to work with anyone who sells counterfeits. Are they using pin artists' images to advertise? Does someone you know recommend them? Are they a middleman or a factory? If middleman, how long have they been working with their supplier? Do they provide inspection reports? *There are very few pin factories in the US, UK, or Canada. Hard enamel pins are not produced in these countries at all. If the price per pin is under $8, it's probably not made in the USA. Depending on where you live, it may be useful to register copyrights for your designs. Under most copyright laws, you own your copyright as soon as you create a work. However, officially registering it can mean additional legal protection. It also makes it easier to fight infringement and submit takedowns. Check out all these artists fighting the good fight! 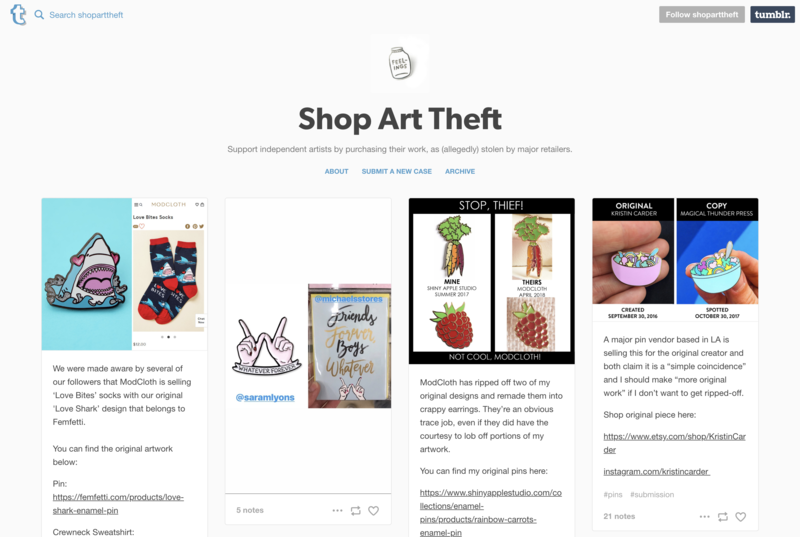 This blog documents cases of alleged art theft by major retailers, for the purpose of educating customers and supporting the original artists. 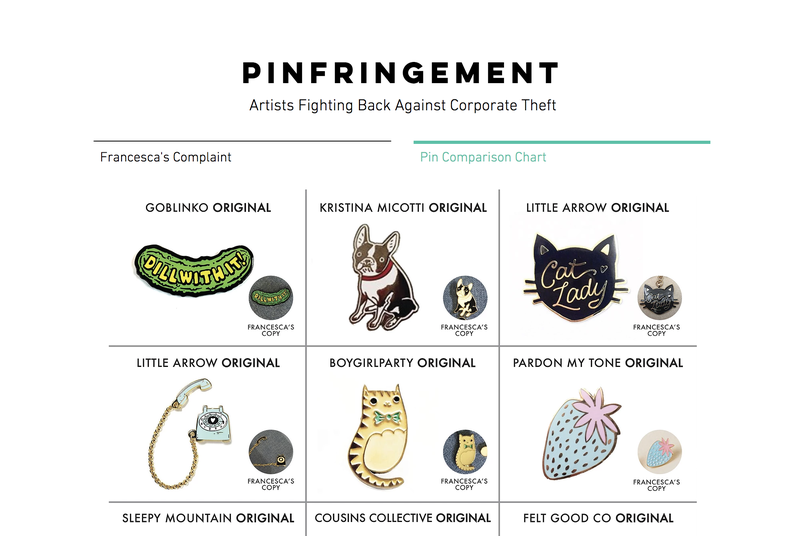 These 11 artists are defending their work from corporate art theft. Check out the website and follow the artists on Instagram for updates!